“Rogue One: A Star Wars Story” is still going strong at the domestic box office. The Disney release grossed another $16.7 million on Thursday, bringing its domestic total t0 $222 million. It is also storming past newcomer titles, Fox’s “Why Him?,” Illumination-Universal’s “Sing,” Fox’s “Assassin’s Creed” and Sony’s sci-fi movie “Passengers” starring Chris Pratt and Jennifer Lawrence. “Why Him?” starring James Franco and Bryan Cranston, earned a solid $975,000 on Thursday, comparable to “Office Christmas Party,” which grossed $950,000 earlier this month. “Sing,” starring the voices of Matthew McConaughey, Reese Witherspoon, Nick Kroll, Scarlett Johansson, Taron Egerton and Seth MacFarlane, earned $9.6 million at the Thursday box office, bringing its cumulative total up to $20.6 million. It is expected to make $37 million over the three-day weekend and $55 million over the five-day holiday weekend. Michael Fassbender’s video game adaptation “Assassin’s Creed” fought its way to $2.8 million, after debuting to $1.35 million on Tuesday. By the end of the five-day holiday weekend, estimates have it grossing $33 million. Based on the best-selling video game franchise, “Assassin’s Creed” stars Fassbender as Callum Lynch. After a mysterious organization fakes his death, Lynch is forced to unlock his genetic memories, allowing him to experience the adventures of his ancestor, Aguilar, in 15th Century Spain. Directed by Justin Kurzel, the film also stars Marion Cotillard, Jeremy Irons, Brendan Gleeson, Charlotte Rampling, Michael K. Willaims and Khalid Abdalla. The movie has a score of 19 percent on Rotten Tomatoes and a “B+” CinemaScore. And “Passengers” grossed another $3.23 million on Thursday, having earned $7.3 million so far at the domestic box office. “Passengers” is tracking for a $26 million three-day weekend and $39 million five-day gross. The sci-fi film was directed by Morten Tyldum and revolves around two spacecraft passengers who are awoken 90 years too early as they travel to a distant planet. “Passengers” has a score of 32 percent on Rotten Tomatoes and a “B” CinemaScore, and cost around $110 million to produce, excluding marketing costs. On Christmas Day, Denzel Washington’s “Fences” and “La La Land” expand wide, while other awards contenders like “A Monster Calls,” “Silence,” “Julieta” and “Toni Erdmann” are opening in limited runs. Who was the biggest star in "Rogue One"? That's a question we're setting out to answer, and it's a tough one at that. 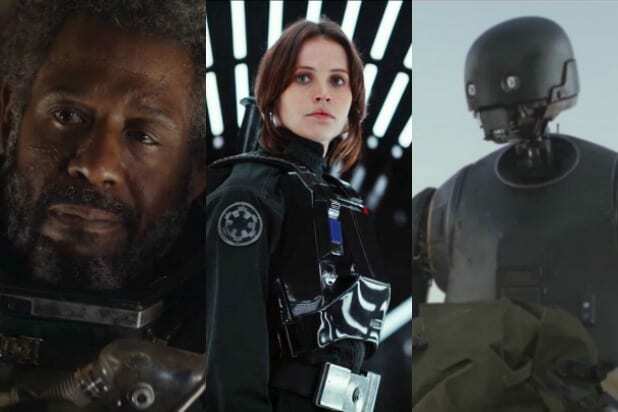 With a cast that boasts the talents of Felicity Jones, Forest Whitaker and Diego Luna (just to name a few), it's hard to pick out the best of them. See how your list compares to ours. The worst of all the “A New Hope” call-backs. Not only does C-3PO continue the trend that no one has written him a funny line since “Return of the Jedi,” but this almost comes off as a plot hole, since the two droids must be immediately sprinting to Princess Leia’s blockade runner in order to appear in the next movie. Of all the call-backs to “A New Hope,” Dr. Evazan and Ponda Baba — the two guys who mess with Luke at Mos Eisley before Baba gets his arm sliced off by Obi-Wan — seem the most unnecessary. These guys must have walked directly to their ship and taken off in order to avoid getting wiped out by the Death Star, only to pick the extremely wrong bar fight just days later. It’s hard not to feel bad for this pilot, whose whole reason for existing in the battle of Scarif is to explode and leave space on the call sign roster for Luke Skywalker. This blurry look of panic is the beginning and end of his tragic story in the movie. Because apparently, it just wouldn’t be New “Star Wars” without a nonsensical, completely extraneous, totally gross alien with tentacles. Working under Saw Gererra, Edrio Two-Tubes may not have been the most gentle freedom fighter, but he certainly was efficient. Along with his eggmate Benthic, Two-Tubes was a daunting addition to Gererra's ranks of radical fighters. Of course, the problem is that they're horrible people without being the bad guys -- and since we don't really get to know them they're kind of just these random extra irritants. Another of the new aliens, Bistan was part of the ground team on Scarif, and another incredible participant to watch throughout the battle. You'll wanna keep your eyes on the awesome new pair of aliens -- because if you blink you'll miss them. This ferocious little freedom fighter was a daring part of the battle on the beaches of Scarif, ready to go into battle the moment he recognized the perfectly rebellious plan. Though awesome, he and Bistan are ranked so low because they're massively underused. Hey, remember him? He doesn’t have long to live. Like a couple of weeks at the outside. An explosives expert and a sniper, Weeteef’s major actions were seemingly cut from the final version of “Rogue One.” While we see nothing about this guy, he does rank as the Warwick Davis character most difficult to recognize as Warwick Davis -- after Wickett the Ewok, since that required Davis to wear an entire Ewok suit. Cassian unceremoniously executes this rebel informant to avoid capture by the Imperials. He’s one of the few people in the game who comes off as sufficiently worried about the Empire as a threat. While he’s mostly for setting up plot and giving some insight into Cassian’s character, Tivik at least gets to freak out appropriately before getting blasted. And one quick nod to the Princess herself, who would eventually lose her planet and nearly her entire family to the ruthless wars across the galaxy, yet still picked up at the beginning of every day to lead in place of her adoptive father. Leia, like her brother Luke, represents the hope that carries forward from the efforts of the "Rogue One" crew. Unfortunately, the surprise appearance of her CGI face is, uh, pretty alarming. Jyn manages to save this kid, who exists simply for Jyn to save her in a heroic moment. Too bad she, her whole family, and probably everyone she knows got eradicated within a few hours. He may not be a fan favorite, but Draven functions a lot like the Mace Windu of the Rebellion, with orders that are well-intentioned but perhaps harsh and misguided. Draven has very obviously seen quite a bit in his time, and still believes in the Rebellion, despite his seemingly too-militaristic nature. Needless to say, his attitude bumped him down quite a few notches. A gentle nod to the General who saw the Rebellion through alongside Mon Mothma and was part of Leia's most trusted pool of advisers. Dodonna's years and empathetic nature mesh well in stories like Mark Waid's "Princess Leia" miniseries, so it was nice to see him again. Of course, here he's played by Ian McElhinney (Ser Barristan from "Game of Thrones"), who has a pretty alarmingly different voice from the actor who played Dodonna in "A New Hope." Among the rebel commandos on Scarif, for a while it seemed like Tonc had a winning ticket. He got to stay back on the ship with Bodhi and hold down the fort until everyone escaped. That didn’t really work out, but Tonc still got to die semi-heroically by trying to fight toward the communications tower linkup. He provided essential human shield assistance. Of the military commanders in the Battle of Scarif, Raddus is the most heroic and together. He wants to take the fight to the Empire from the start and doesn’t back down from a fight. Unfortunately, someone at Lucasfilm decided he should have an extremely gross, wobbly chin, and it’s impossible to focus on the fact that he’s a solid character because of it. This guy deserves a massive shout-out as one of the most enthusiastic and skilled rebel pilots in the film. Devoted to the cause, General Merrick likely earned his status thanks to his excellent strategic skills -- and his determination to do good in the face of the most dire situations. And then he crashed his X-Wing into the ground. 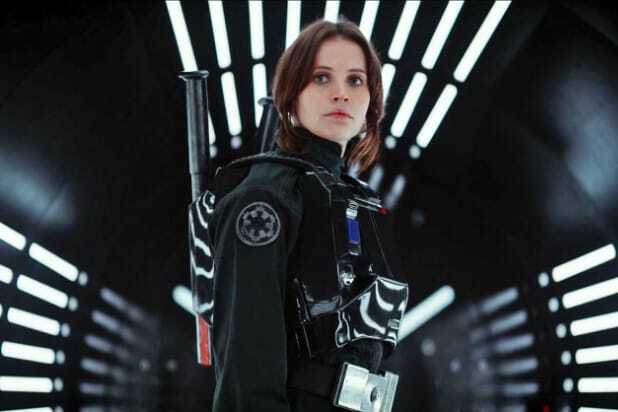 Toughened in the face of ongoing war and a crumbling marriage, Lyra Erso may not stand out too much in "Rogue One", but her dedication to her family -- and her clear hatred of the Empire -- shines in James Luceno's novel, "Catalyst". It's hard to hate Lyra, but her use as little more than a classic Dead Disney Mom was a little bit of a bummer. Okay, so Krennic's guidance of the Death Star project may not have been successful without Galen Erso's extensive genius and a little babysitting by Tarkin. Still, his sarcastic nature and epic cape painted a picture of the Empire at the top of its game. That facade is probably why, in the face of any failure, Krennic can't help but get angry. His hissy fits, though not as bad as Kylo Ren's, keep him down at unlucky number 13. The former chancellor now oversees the growing Rebellion, seemingly benevolent in the face of exceptionally hard decisions. Leia Organa's future mentor is best known calm and thoughtful nature in the face of massive chaos throughout the galaxy. She has a lot of lines, but it feels like she's kind of just there most of the time. Bail Organa practically funded the Rebellion by himself and pushed it forward from the moment Padme Amidala proposed it to her most trusted political allies (in a deleted scene from "Revenge of the Sith"). Jimmy Smits' return to the character showed a grey-haired, yet ever determined Organa whose faith in his daughter would help see the Rebellion to victory. His part is actually much better than the random cameo we were expecting. The Dark Lord of the Sith makes a triumphant return of sorts in the film at the very height of his career, and it shows. He may not have been around for everything, but his moments were intense and so perfectly Vader that he would have slashed his way to the top -- if not for that horrible one-liner he throws at Krennic. He may not have known he was a father at that point, but he still managed one hell of a dad joke. One of the surprise key players in the film was none other than Grand Moff Tarkin himself, who's been pretty important in a lot of recent ancillary materials. Tarkin has popped up in the "Rogue One" prequel novel "Catalyst," the novel "Lost Stars," the "Star Wars Rebels" TV series, and even had a novel that was all about him (called "Tarkin"). He's still a force in "Rogue One," and at least his CGI face (RIP Peter Cushing) is pretty good most of the time. Partially insane thanks to almost three decades' worth of radical fighting, Gererra is no longer the militaristic older brother that he was during the Clone Wars. Thanks to Forest Whitaker, Saw has an absolutely huge presence in "Rogue One." The man behind the Death Star's design may not have had the best marriage to write home about or the best judgment when it came to friends. Still, as he dug the hole that would eventually land him under Krennic's iron fist, he tried his best to stop it. And he did, through his daughter and, by extension, Luke Skywalker exploiting a weakness Galen had built into this monstrous creation. Chirrut's partner-in-justice may appear gruff, intimidating and huge (which he is), but Malbus has a sense for things that many of his violent nature don't. Empathetic and supportive in his own unique way, Malbus doesn't think twice when it comes to following Chirrut into the Rebellion, and seems to like the idea that he's helping others out. Oh -- and he's a totally badass sniper, too. Don't overlook the fidgety Bodhi. His anxious nature and comedic one-liners mask what seems to be a massive amount of regret. Without Bodhi's abandonment of the Empire, the Rebels may have never known about the Death Star project at all. So, you know, he's kind of a big deal. So very often in narratives about war and conflict, valiant heroes are given the choice to do what is right, or to just follow orders. This war-weary rebel was more than just a soldier, and his decision to abandon orders in the face of a suicide mission made him a hero for good. Jyn's shock at being thrown into the fray by the Rebellion didn't last very long, and the self-sufficient heroine didn't piddle around with her decision to join when the stakes were made personal. Jyn may not have been the most heroic person starting out, but her worth was proven by a relentless determination to do the right thing when the galaxy needed her to step up. The scene-stealer of "Rogue One" was none other than the reprogrammed Imperial security droid with an attitude. "Star Wars" is known for having complex, interesting robots, but "Kay" might rise above the rest with its steely, protected little heart of gold. Donnie Yen's casting made headlines for good reason -- the talented actor and martial artist puts everything into his performance to create incredible characters. Wise, loyal and kind, Chirrut is a fantastic representation of the confidence and belief in the Force that the Jedi Order of the prequels was missing. Future heroes take note: this is how you do it.